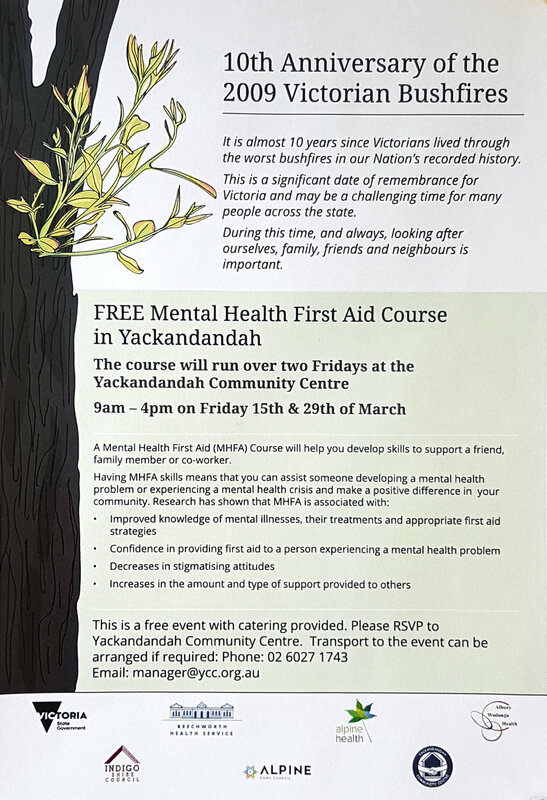 To mark the 10th anniversary of the 2009 Victorian Bushfires there will be a free Mental Health First Aid Course run at the Yackandandah Community Centre. It will help you develop skills to support a friend, family member or co-worker. Having Mental Health First Aid skills can assist someone developing a mental health problem or experieinceing a mental health crisis and make a positive difference in your community. This is a free event with catering provided. Please RSVP to Yackandndandah Community Centre. Transport to the event can be arranged if required. Research has shown that completing a Mental Health First Aid course can assist with improved knowledge of mental illness, treatments and first aid strategies. It can help increase the level and type of support offered in your community, and decrease stigmatising attitudes. Exhibition: "A Time Before" by Central Arrernte Artist Stephen Berger.